by caroline - Crown pottery mark looks like "MZ" - but says "MV" for "Muller Volkstedt"
Crown pottery mark looks like "MZ" - but says "MV" for "Muller Volkstedt":- Can you tell me what porcelain mark this is? 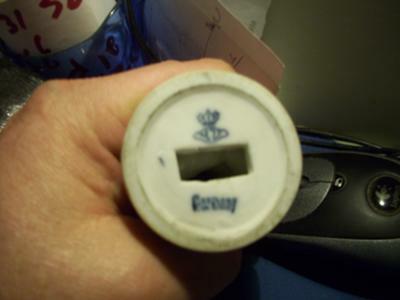 - crown with moth shape beneath :- I can't find this stamping anywhere. It is made in Germany. Please help. Crown pottery mark looks like "MZ" - but says "MV" for "Muller Volkstedt"
There are many thousands of marks with crowns and this one is not one of the more easily recognizable ones. A little more effort would surely have helped your cause. 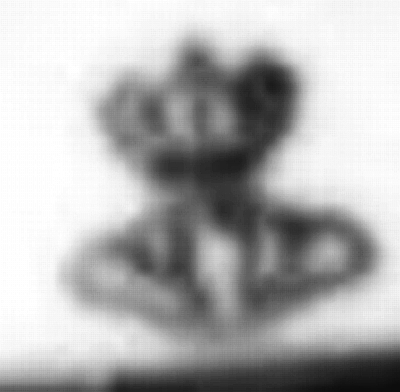 Your picture is small and unfocussed so we can't see the details of either the mark or the figurine (although the figure does appear to have some quality traits). Unfortunately, you have not tried to compensate for this lack of pictorial clarity by trying to describe the mark further in words. We have tried to help you by adding the 'moth' description in your title, as this is the best we can see and we have also tried to enhance your photo of the mark. There may be letters and distinct shapes within the mark, but it is impossible to make out from the sparse information given. We have the answer to this mystery mark now thanks to various contributors to various threads which have accumulated on various places over the site about this mark. The Company is Muller & Co one of the Volkstedt (Rudolstadt, Thuringia) makers - the place where they developed the famous technique for real Dresden lace technique. Note, the pottery mark looks (at least to my eye) as if it says the initials "MZ" - but in actual fact it says "MV" which stands for "Muller Volkstedt". Another thing which makes this mark hard to find in the mark catalogue books is there are so many hundreds of Germanic crowns and, apart from it being like looking for needle in a haystack, this mark is listed under "Crown with drapery/scroll/streamer" in Rontgen's encyclopaedia - a section which I would never have considered looking at for this mark (as it looks like a shield, not drapery, to my eye). This company was obliterated by the Allied bombing in the second world war, but resurrected after the war by descendents of Muller and relocated to Ireland, becoming well known as "Irish Dresden". So this style of mark MZ (Actually MV)- which has several variations, was used in the first half of the 20th century. Irish Dresden has it's own marking system. Anton Muller was working in the porcelain industry in Volkstedt in the late 19th century. He became highly regarded and formed his own studio in 1907. We have had another entry on this same mark which has a clearer photo. The mark appears to say MZ. Please post there if you can help our quest. This is not Moritz Zdekauer Altrohlau Porcelain Factory - It is MV Muller Volkstedt (scroll to my answer above for full report). We also had one of these figures with this mark sent to our expert identification and valuation service (to find this service - click on the treasure chest photo on the top right of the right column on this page). 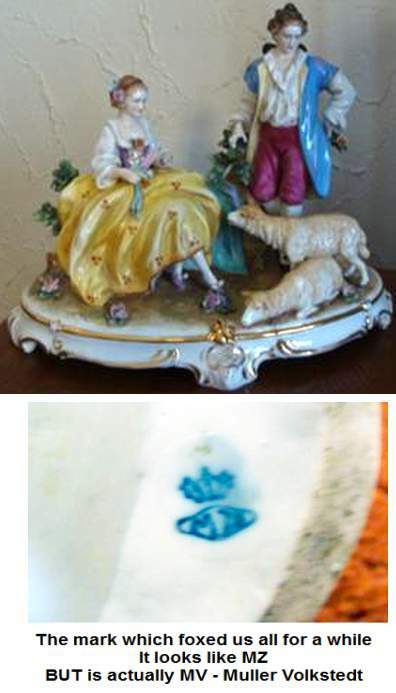 A crown with "MV" beneath indicates your miniature figurine was made by the Mueller-Volkstedt works based in Thuringia, Germany. Begun by Anton Müller, this was one of the smaller Volkstedt factories and was in operation in Germany from about 1907 to 1945 . Not to be confused with the original Schwarzburg-Rudolstadt Volkstedt factory famous for lace figurines. The exclusive privileges of the original Volkstedt factory was revoked in 1832, opening the way for smaller porcelain workshops to be opened in the region, like the one opened by Anton Muller. The Mueller-Volkstedt factory was destroyed in the Allied bombings and later relocated to Ireland and re-launched as ‘Irish Dresden’ which normally carries the traditional MV Muller-Volkstedt back stamp with the additional wording "Irish Dresden" or a mark of a black shamrock. Dresden lies over 100 miles away from Volkstedt, so the word Dresden is used stylistically only. I had been doing some research myself, and managed to find it too. 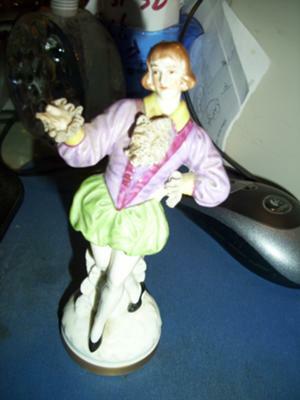 I actually got a book out of the Library called Marks on German, Bohemian & Austrian Porcelain 1710 to Present. It was in there. Here's my lovely pieces which, incidentally, I am wanting to sell. The mark matches "Irish Dresden". Irish Dresden is in Ireland but according to their history they originated in Dresden. But some people say they are fictions and are only a new company who attached their history to be from Germany. But the mark looks like Irish Dresden. I research marks very throughtly. This is the real story. Anton Muller began production in Thuringia in Germany in the late nineteenth century. The business "Muller Volkstedt" (MV) thrived until the forces of history overtook it when Muller’s grandson Erich, died on the Eastern Front in the Second World War and the business faced closure. Other relations, the Saars, took it over. Frau Saar was Anton Muller’s niece. In 1962, the Saar family moved the whole business to County Limerick in Northern Ireland. There, they re-established it as ’Irish Dresden’ and the legend ‘Irish Dresden’ then appeared below the registered MV mark, as on these pieces plus an "R" mark to denote copyright. I would place all these pieces as being made in about 1965. The three figure group was certainly originally designed in the days when the firm operated from Germany. I know this because I had one some years ago which bore the original mark. The 'V' in the mark looks like a 'Z' simply because it is lying on its side! I have a great figuring that I know is MV but can’t find any information about it. The piece appears to have hand painted " the bird catcher" on the bottom. Does anyone know where I can find information about this.